The students were supposed to be performing the song “Y.M.C.A.” during Bennett Elementary School’s May talent show. For the show, a first-grade teacher asked parents to have their kids wear clothes like the Village People, the group that recorded the hit song in the 1970s. Some would come dressed as a policeman, a cowboy, a biker dude, a construction worker or a Native American. “I'm not in a position to do anything for these educators, and hopefully those people that are can make the right choices so all students of any culture and race won't feel singled out or like their race is being stereotyped against,” Bolman said. The Bennett Elementary staff pulled plans for “Y.M.C.A.”Comment: This is a classic example of how stereotyping is perpetuated. 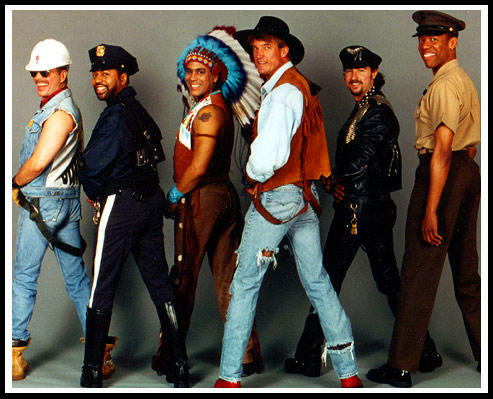 People continue to portray or parody the Village People, and of course the band continues to perform. While the other portrayals are close to the occupations they portray, the "Chief" is an outdated stereotype from a century or two ago. It's also the only racial caricature in the group. Yet no one points out the anomaly--that one of the five performers doesn't match the other four. That one is an ignorant stereotype like every mascot, Halloween costume, or hipster in a headdress. Instead, the message is sent that this is what an Indian looks like. Because everyone treats it as good and normal, it reinforces a million other stereotypical images in our society. Collectively they tell us that Indians are nothing but primitive people of the past. For more on the Village People, see Village People in Family Guy and What's Wrong with the Village People?